Would you like to feel happier, more contented and joyful? Whether you're already happy and just need a boost, or you've been feeling stressed, sad or dissatisfied, this workshop has something for you. You will learn and experience proven techniques for lifting your long term happiness. You'll also experience several deeply relaxing and happiness creating Hypnosis sessions. 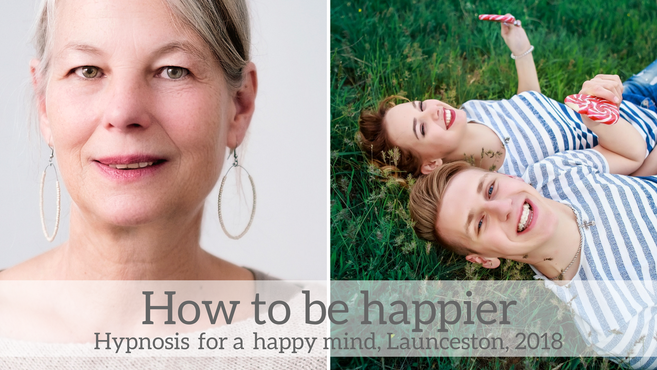 This Launceston workshop uses the best Hypnosis and NLP (Neuro Linguistic Programming) techniques to lift your mood and help you to feel happier and more contended in the future. You will have your own comfortable leather recliner, and the best in sound and light technology to ensure you can relax deeply and enjoy the experience, whether you are new to Hypnosis or a regular user. "From the moment I walked in the door, I felt calm and comfortable. I have a busy life and needed help with stress. Louise immediately made me feel at ease and my active mind turned off. She knew how to get to the route of my stress and has helped me find a way to deal with it. I've never felt so relaxed. I highly recommend Louise and I can't wait for my next session."